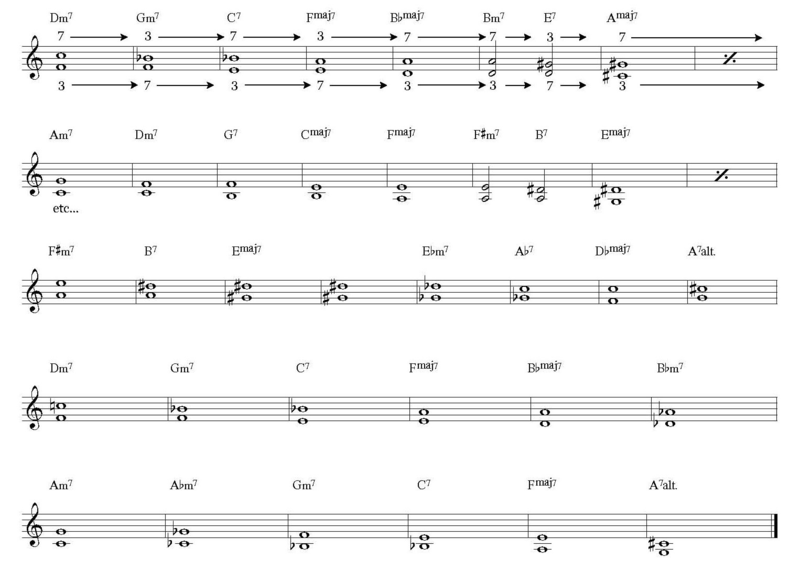 One of the most useful concepts which has emerged in jazz theory is the notion of guide-tones. Guide-tones are melodic lines constructed from one or two pitches strategically extracted from each chord of a tune’s changes. The idea is that if you distil a chord down to its essence, or its “shell,” you can begin to create a melody that outlines the harmonic progression of a tune with minimal effort. Then, after developing a basic guide-tone melody, you can begin to elaborate on it, embellish it, and decorate it, which allows you to generate new and creative musical vocabulary while simultaneously clearly referencing the chord changes. The guide-tones most frequently and effectively used are the 3rds and 7ths of the chords in a harmonic progression. 3rds and 7ths work very well as guide-tones because they are the pitches that define the difference between the three most common types of chords in jazz harmony: major 7th, minor 7th, and dominant 7th chords. To illustrate this, think about Cmaj7, Cmin7, and C7. The roots and 5ths of all three of these chords are the same two pitches: C and G (which are typically the notes the bass player is most likely to emphasize while walking bass lines). What differentiates Cmaj7, Cmin7, and C7 from each other are the particular combination of 3rds and 7ths (natural 3rd + natural 7th = maj7, natural 3rd + lowered 7th = dominant 7, and lowered 3rd + lowered 7th = minor 7th) . So, since the bassist is already generally outlining roots and 5ths, you can focus on emphasizing the 3rds and 7ths of the chords as the key notes which define the harmonic progression. After mastering the guide-tones of a given tune, the next step is to create melodies based on the guide-tones by decorating, elaborating, and/or embellishing the guide-tone melody. One of the best ways to do this is by deploying the strategy of adding neighboring chromatic tones to the guide-tone line. 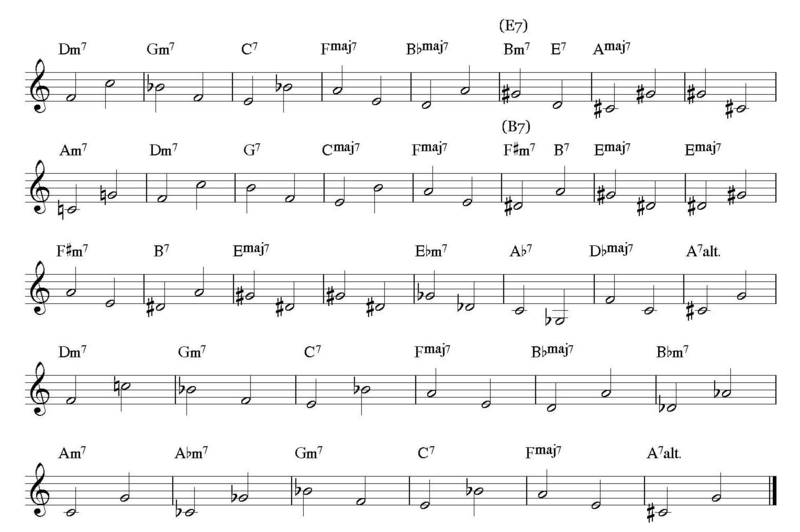 The use of added chromatic tones is an entrenched part of the jazz tradition and an effective strategy especially prevalent in bebop. The idea is to pick a “target” or “goal” note and “approach” the target pitch by constructing a melody consisting of added notes above and/or below it. 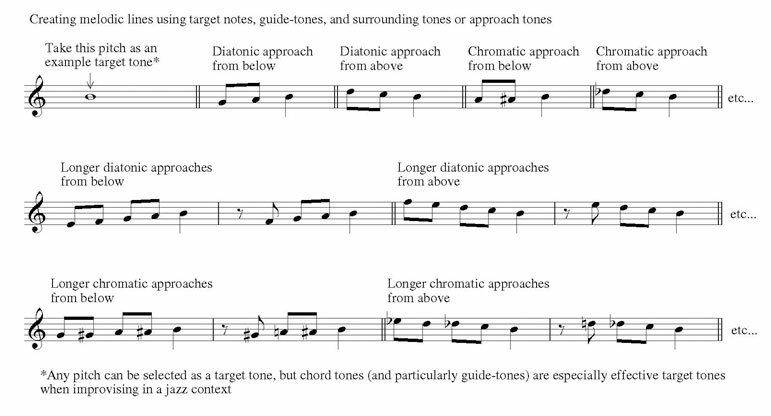 Combine the guide-tone concept with diatonic and/or chromatic surrounding tones, and you have a ready-made system to spontaneously generate melodic vocabulary over a tune without having to rely on “lick playing,” which I’ve discussed before here on LJS. Practice stringing together the 3rds and 7ths of the chords as guide-tones melodies over jazz standards. Practice surrounding/approach tones using every note on your instrument as a target note. Combine the two ideas and try practicing and inventing new melodies over jazz standards by using approach/surround tones using the guide-tones as your target notes. 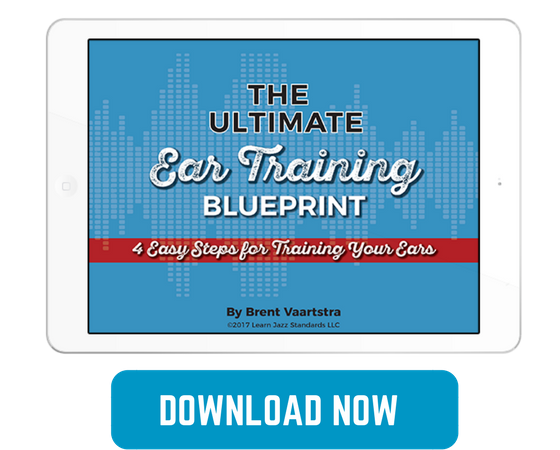 If you want to get more information on guide tones and dig in a little further to the basic approach, check out this related video that Brent put together. Best of luck with your practicing and always remember to take action! Question: what are the guide tones for a Major 6 chord? Great lesson , really hit home for this amatuer trumpet player! Thank you for this post, it's very clear and helpful. Hey, thanks a lot for this post! Like most of your LJS posts it's very helpful – not least because I'm just about to learn All the Things You Are. I was just wondering if it's possible somewhere on the page (I haven't found an icon if there is one) to download the scores as a PDF? Or even the whole post? It would be great if one could do that. I think you can save the scores by right-clicking on them and save images. You can also "print" the page as a PDF (File>Print…). Thanks, Nobody. I hadn't thought of that option. But it worked. You're welcome, I'm glad it was helpful and you figured out the PDFs – thanks for reading and supporting LJS!